How much specifically can be written about an offensive lineman's play? Not much I'm afraid, but Covert's play still has him mentioned as a possible NFL Hall of Famer even though he's been eligible for selection since 1996. Covert was chosen with the first of the Bears' two first-round selections in the 1983 draft. Despite his legendary status, Covert was actually threatened with benching by an impatient Mike Ditka during his rookie season, but went on to start all 16 games. 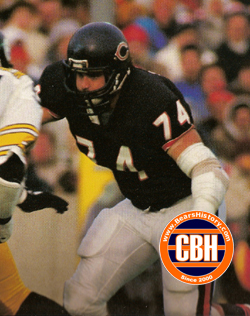 He followed up the strong rookie season with another in 1984, and made the Pro Bowl in 1985 and 1986 when the Bears' offensive line was known as the best in football. Injuries began to take their toll on Covert starting in 1987, but he rebounded with solid years from 1988-1990. During the offseason prior to 1991, Covert ruptured a disc in his back and decided to retire. Had Covert been able to play several more seasons, he would be a virtual lock for the Hall of Fame.